Craig Willis kicked 14 points for Falcons to secure the victory. 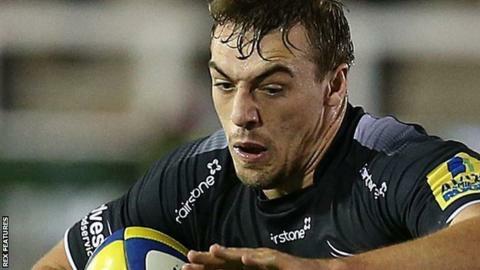 Craig Willis' goalkicking edged Newcastle Falcons to a first Premiership win of the season against last season's runners-up Bath. In atrocious conditions, Falcons survived Guy Mercer's early try to open up the lead through Rob Vickers' score and Craig Willis' eight-point haul. Rhys Priestland kicked Bath back in front but Willis' brace of penalties ensured four precious points. The win lifts Falcons off the foot of the Premiership. Bath's tumble down the table after last season's flying run to the Premiership final has been a perplexing one, as they named a strong side with a particularly strong bench for this trip to the north east, but they have failed to find their form this season. Omens did bode well for Mike Ford's side, who had won their previous 10 visits, but despite an early breakthrough, they struggled to match the intensity shown by the Falcons under the drizzle and wind. In fact the scoreline might have been greater had Willis not passed up three penalty goal chances in the first half. Amid the rain and gloomy skies, Mercer rolled over for Bath after a line-out drive to give the visitors an early advantage, but Vickers crossed after strong Falcons pressure to gain the lead. Henry Thomas was sent to the sin-bin as Bath failed to keep their discipline and Willis' kick gave the hosts a cushion at the break - although it could have been a greater tally had a try not been chalked off by the TMO. Priestland and Willis then traded penalties in a gritty second period, with the latter coming out on top with two late efforts to lift the Kingston Park crowd. "It's a great start to the year. I thought we deserved the win. "Okay, we missed a few points, but we came up with the goods and deserved it. "The boys stuck to their guns and it's probably the first time this season we've done that. "Now we need to take that into the game at London Irish and build on it." "Credit to Newcastle - they defended really well but our players really need to have a look at themselves and question whether they were really ready to play. "It was wet and windy, but then it often is here. We have to look forward but we also have to be truthful and it's all about responsibility and you cannot just expect to turn up and win. "The players are back in on Tuesday and I expect them to hold up their hands, talk about it and then move on." Newcastle: Hammersley; Tait, Harris, Socino, M Watson; Willis, Young; Vickers, McGuigan, Welsh, Wilson, Robinson, Hogg, Welch (capt), Latu. Replacements: Lawson, Rogers, Ryan, Botha, Clever, Dawson, Catterick, B Agulla. Bath: Homer; H Agulla, Joseph, Devoto, Banahan; Priestland, Matawalu; Auterac, Batty, Thomas, Garvey, Ewels, Houston, Mercer (capt), Denton. Replacements: Dunn, Lahiff, Wilson, Day, Louw, Evans, Ford, A Watson.